Talented Russian artist, portraitist. Wrote genre paintings. 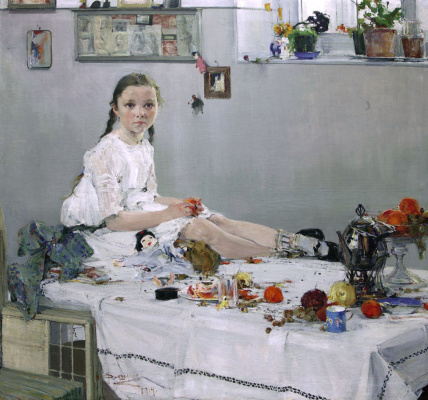 Occupied a significant place in Russian portrait painting the 1910s was Decided interesting artistic tasks in the portrait genre, introducing the motives of still life, using the open air. Worked in the traditions of Russian psychological portrait. Works are kept at the Academy of arts, state Tretyakov gallery, state Russian Museum, the Museum of fine arts of Tatarstan in Kazan, in private collections of the USA, Moscow, St. Petersburg. The name of the artist Nikolai Fechin not very known in Russia today, but in the beginning of the last century it was famous. This native of Kazan was nominated to become the new Malyavin and was one of the most popular artists of the Russian Bohemia. His paintings are in great demand not only in Russia, but also abroad. "The astonishing power of feelings, so typical of this Russian", were delighted with the American people in 1910, when he first saw the portraits created Niesina. His father, a carving of the iconostasis, was too early to bring the boy to his work. In fourteen years Feshin he enrolled at the Kazan art school, and in 1901 by her recommendation was adopted at the Higher art school at the AH, soon moved into the workshop I. Eremina. Having received from the teachers of his later style wide free smear, based on genuine ownership pattern, Feshin found an original talent colourist, deliberately restricted the colours of his palette. About his pupil of Ilya Repin spoke bluntly: "the Best Russian painter". Graduated from St. Petersburg Academy of arts in 1909 Nikolai Fechin was then in his early career and moved from peredvizhnicheskogo realism to avant-garde: broad strokes and instantly captured composition. 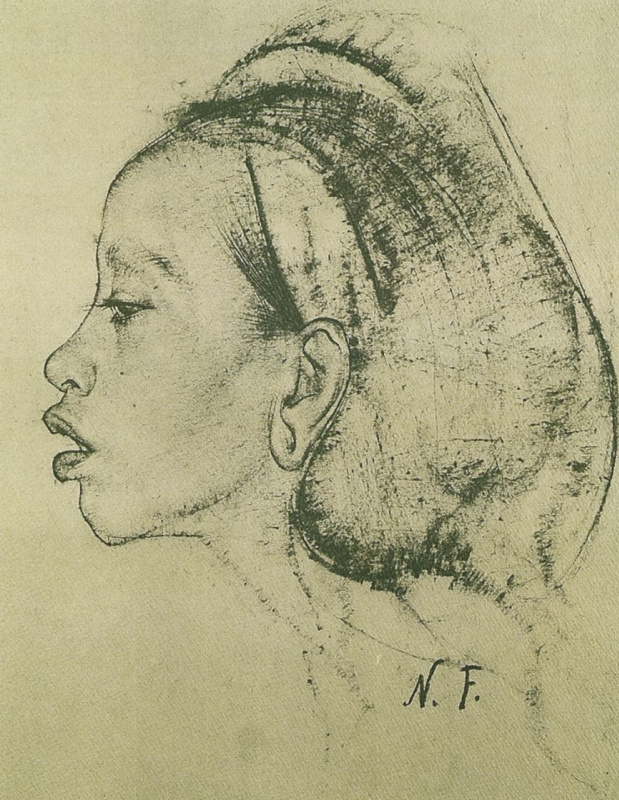 Last academic years were marked by the recognition felinskiego talent: "portrait of an unknown woman" (1908) was acquired by the Museum OH and next year is awarded a gold medal at the international exhibition in Munich; competitive program "the Butterfly" (1909) earned him the title of the artist and the right to a pensioner’s trip, which Fechin limited few summer months 1910; by the fall, he returned to teaching at the Kazan art school. Since 1909, Feshin is a constant participant of international exhibitions in Europe and USA (Pittsburgh); in 1916 he became a member of the society for travelling art exhibitions and received the title of academician of painting. In these years, it created the most significant works: Portrait Vari Adoratsky" (1914)-one of the top children’s images in the art of the turn of the century, Portrait of N. M. Sapozhnikova" (1916), "Portrait of father" (1918). After the revolution Feshin completed begun in 1912 gloomy story and expressiveness of color picture "the Massacre" (1919). In 1923 he emigrated to the USA and settled in new York, but got sick tuberculosis, and doctors advised him to move to places with drier climate. Friends invited him to new Mexico, in Taos, where at that time lived a whole galaxy of American artists, including the famous Georgia O’keeffe and a native of Russia Leon Gaspar. Creative atmosphere, dry climate and unique beauty of these places liking Feshin. In1927 year he moved to Taos with his wife and daughter. And by 1933 in Taos has a house, when you first look at who remember Abramtsevo. This house was all designed by the artist and that was the combination of Russian folk motifs with an Indian. However, when the building was completed in 1933, the wife Feshin — Alexander — files for divorce. After the divorce, Nikolai Ivanovich departed with Their daughter in new York, where he lived for only a year, and then together with his daughter moved to California. Art historians say "Taos" creative period Feshin most vivid and fruitful. The artist worked on for commissioned portraits, performing them in his brilliant technique. Powerful, violent, and paradoxically harmonious painting Feshin can only be compared with Soutine paintings. Anyway, moving the brush masters almost physiologically gives the viewer a charge picturesque energy. In a peculiar manner reminiscent graphics, Holbein, created a master and an extensive series of drawings of the local ethnic group. Since 1936 Feshin traveled a lot and visited in Mexico, on the island of Bali. In 1947, he bought a house in Los Angeles Santa Monica. There Oktyabrya 1955 he died quietly in his sleep. According to his Testament daughter in 1976 carried his ashes home — in Kazan. Nikolay Feshin left a great legacy. However, to say exactly how many they were written, nobody can. The main problem is that Feshin often presented or exchanged their work, and in any collections they are now, nobody knows. It is known that the largest number of works is the home of the artist — in Kazan — the State Museum of fine arts of the Republic of Tatarstan. There are about 200 of his works. A large collection gathered in the Museum stark in Texas — 68 works. Paintings Feshin also kept in the Museum of American art, Smithsonian institution in Washington, the National portrait gallery in London, the Museum of the fry in Seattle, Museum of Harvard University. A lot of the work turned out to be in private collections. Americans believe Nikolay Feshin "their" artist. But he never forgot about his homeland and, according to his daughter, always said that the strongest and most long-lasting effect on any artist has everything that is connected with the country where he was born. The life of the Feshin and his works are unquestionable proof of that. Nikolay Feshin was born in Kazan on November 26, 1881 (new style) in the family of a carving of the iconostasis. At the age of fourteen he entered the Kazan art school, where I studied up to 1900, 1901, on the recommendation of the school was accepted into the Academy of arts in St. Petersburg, in the workshop of Repin, from which he graduated in 1909. 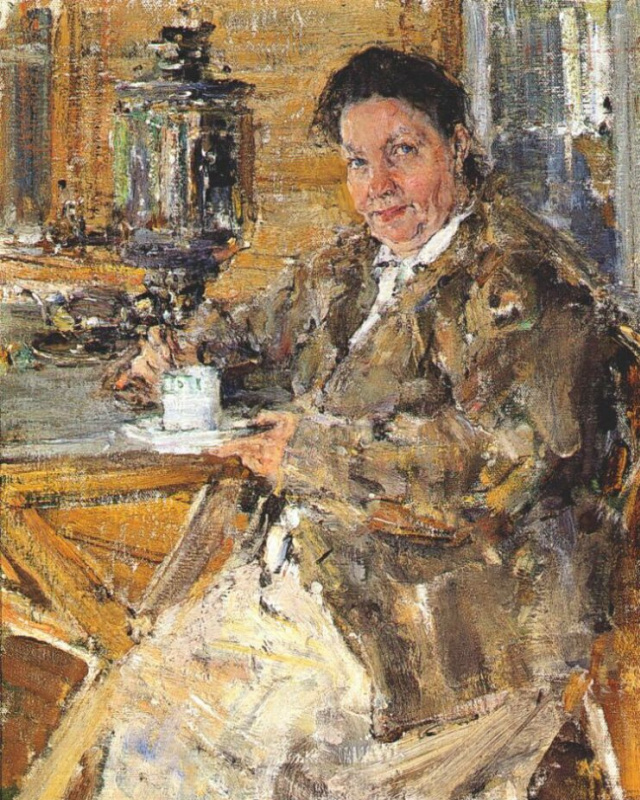 His painting "portrait of an unknown woman" (1908) in 1909, was awarded a gold medal at the international exhibition in Munich and acquired by the Museum of the Academy of Arts, and competition policy work "Butterfly" brought Nikolay Feshin the title of the artist and the right to a pensioner’s trip abroad. The artist has limited foreign trip in the summer of 1910. In 1909 Feshin returned to Kazan and became a teacher in a local art school. In the paintings of Nikolai Feshin 1900-ies dominated impressionism. These pictures were dynamic, colorful and realistic. 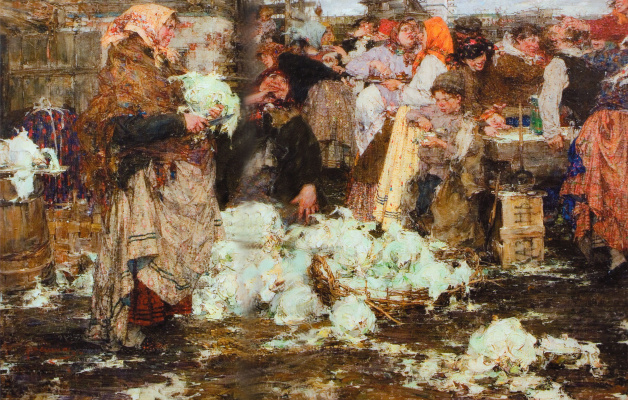 An example of such work can serve as Cheremis wedding" (1908), "Pouring" (1911), in the Museum of fine arts of Tatarstan in Kazan. 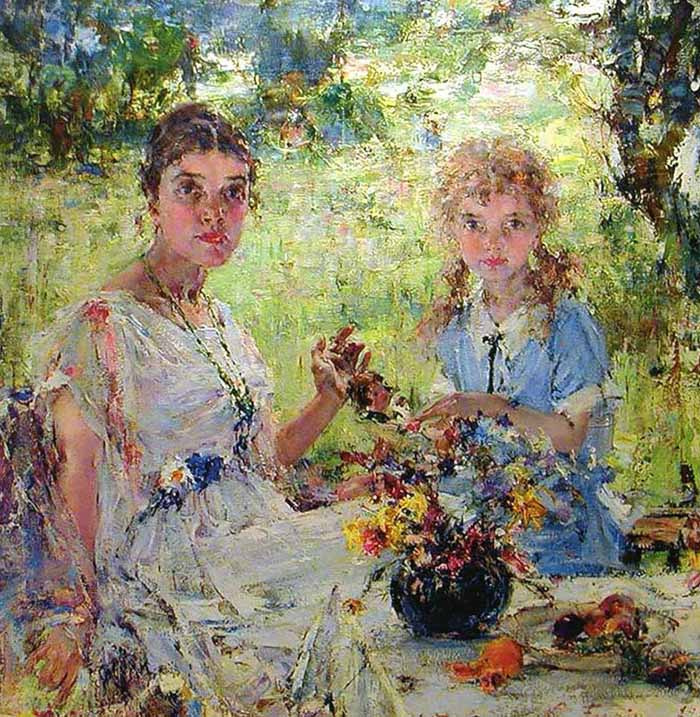 Since 1910 the artist regularly participated in international exhibitions in Europe and USA. 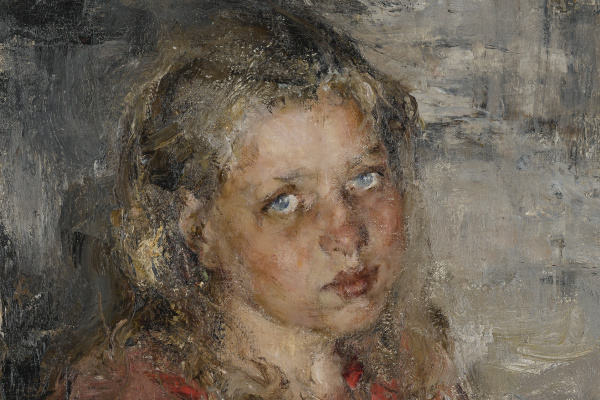 In 1916, Nicolai Fechin became a member of the society for travelling art exhibitions and received the title of academician of painting. The most significant works of the artist were written in the period from 1910 to 1920 years. It is especially famous for his portraits, which include "Portrait Vari Adoratsky" (1914), "Portrait of N. M. Sapozhnikova" (1916) and "Portrait of father" (1918). In 1923 Fechin received an offer to teach in new York and went to the USA. First, the artist lived in new York. There he developed tuberculosis, and doctors advised him to move to the countryside with drier climate. Since 1927, the artist settled in Taos, new Mexico), where he built a home Studio with the "neo-folkloric" own thread of execution. At the end of the 1930s began to travel through Mexico, Japan and Indonesia, rented a Studio in Pasadena, then in 1947 finally moved to Santa Monica. 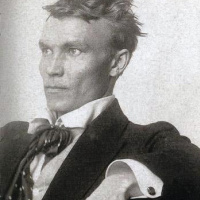 Died Nicolai Fechin in Santa Monica (now part of Los Angeles) October 5, 1955. In 1981, the centenary of birth Feshin, his daughter Oia in belongs to her former home of the artist in Taos founded the Institute named Feshin with a Museum and educational center. After her death in 2002, the house Museum was transferred to the private Fund and is now operational, exposing the works of local artists. 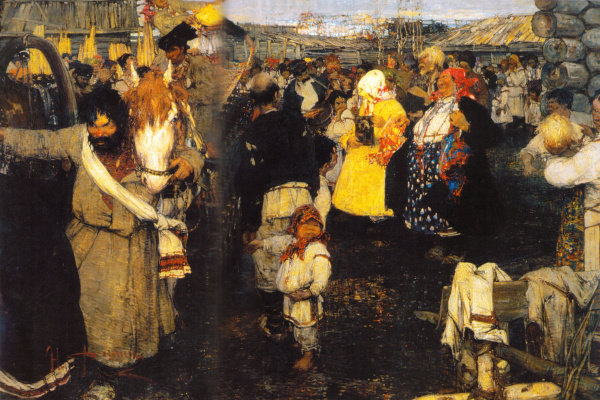 The largest collection of works by Nikolai Fechin, mainly including its pre-revolutionary work, is in the Museum of fine arts of Tatarstan (Art gallery "hezine" in the Kazan Kremlin). "The astonishing power of feelings, so typical of this Russian", were delighted with the American people in 1910, when he first saw the portraits created Niesina. His father, a carving of the iconostasis, was too early to bring the boy to his work. In fourteen years Feshin he enrolled at the Kazan art school, and in 1901 by her recommendation was adopted at the Higher art school at the AH, soon moved into the workshop I. Eremina. Having received from the teachers of his later style wide free smear, based on genuine ownership pattern, Feshin found an original talent colourist, deliberately restricted the colours of his palette. About his pupil of Ilya Repin spoke bluntly: "the Best Russian painter". Graduated from St. Petersburg Academy of arts in 1909 Nikolai Fechin was then in his early career and moved from peredvizhnicheskogo realism to avant-garde: broad strokes and instantly captured composition. 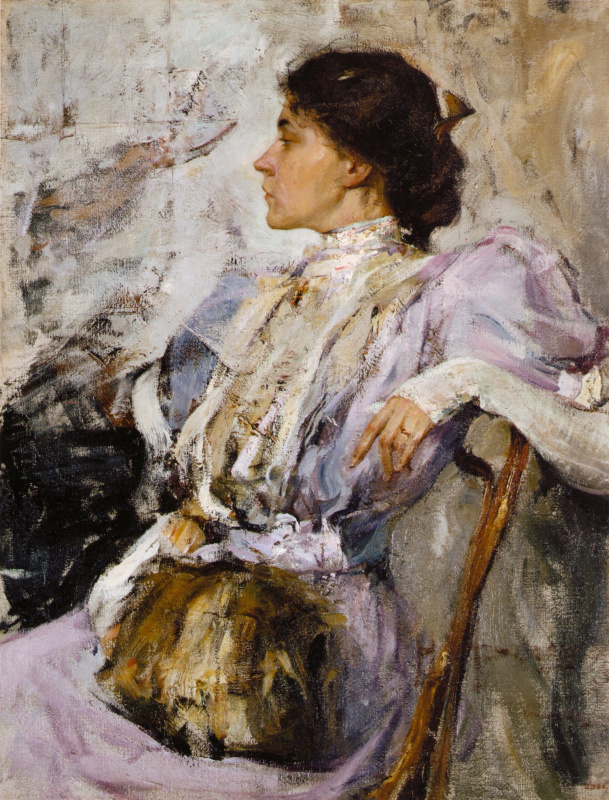 Last academic years were marked by the recognition felinskiego talent: "portrait of an unknown woman" (1908) was acquired by the Museum OH and next year is awarded a gold medal at the international exhibition in Munich; competitive program "the Butterfly" (1909) earned him the title of the artist and the right to a pensioner's trip, which Fechin limited few summer months 1910; by the fall, he returned to teaching at the Kazan art school. Since 1909, Feshin is a constant participant of international exhibitions in Europe and USA (Pittsburgh); in 1916 he became a member of the society for travelling art exhibitions and received the title of academician of painting. 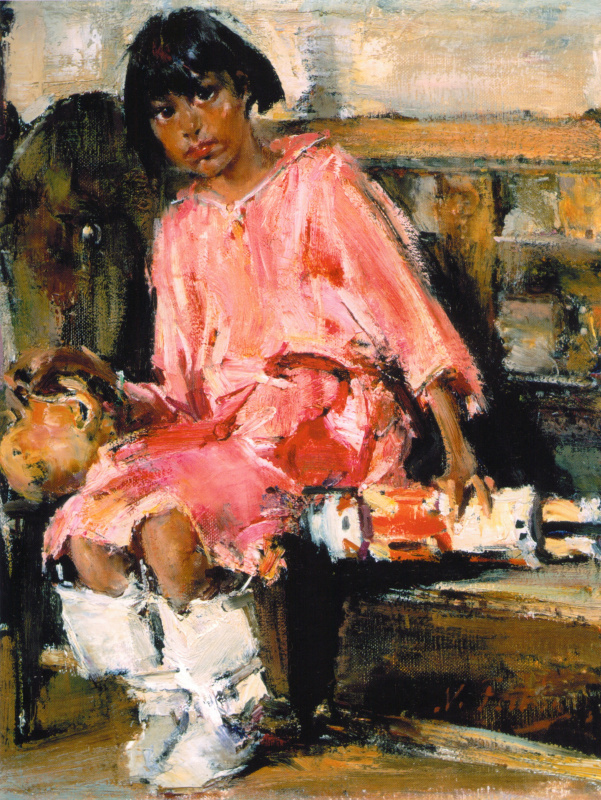 In these years, it created the most significant works: Portrait Vari Adoratsky" (1914)-one of the top children's images in the art of the turn of the century, Portrait of N. M. Sapozhnikova" (1916), "Portrait of father" (1918). After the revolution Feshin completed begun in 1912 gloomy story and expressiveness of color picture "the Massacre" (1919). In 1923 he emigrated to the USA and settled in new York, but got sick tuberculosis, and doctors advised him to move to places with drier climate. Friends invited him to new Mexico, in Taos, where at that time lived a whole galaxy of American artists, including the famous Georgia O'keeffe and a native of Russia Leon Gaspar. Creative atmosphere, dry climate and unique beauty of these places liking Feshin. In1927 year he moved to Taos with his wife and daughter. And by 1933 in Taos has a house, when you first look at who remember Abramtsevo. This house was all designed by the artist and that was the combination of Russian folk motifs with an Indian. However, when the building was completed in 1933, the wife Feshin - Alexander - files for divorce. After the divorce, Nikolai Ivanovich departed with Their daughter in new York, where he lived for only a year, and then together with his daughter moved to California. Art historians say "Taos" creative period Feshin most vivid and fruitful. The artist worked on for commissioned portraits, performing them in his brilliant technique. Powerful, violent, and paradoxically harmonious painting Feshin can only be compared with Soutine paintings. Anyway, moving the brush masters almost physiologically gives the viewer a charge picturesque energy. In a peculiar manner reminiscent graphics, Holbein, created a master and an extensive series of drawings of the local ethnic group. Since 1936 Feshin traveled a lot and visited in Mexico, on the island of Bali. In 1947, he bought a house in Los Angeles Santa Monica. There Oktyabrya 1955 he died quietly in his sleep. According to his Testament daughter in 1976 carried his ashes home - in Kazan. Nikolay Feshin left a great legacy. However, to say exactly how many they were written, nobody can. The main problem is that Feshin often presented or exchanged their work, and in any collections they are now, nobody knows. It is known that the largest number of works is the home of the artist - in Kazan - the State Museum of fine arts of the Republic of Tatarstan. There are about 200 of his works. A large collection gathered in the Museum stark in Texas - 68 works. Paintings Feshin also kept in the Museum of American art, Smithsonian institution in Washington, the National portrait gallery in London, the Museum of the fry in Seattle, Museum of Harvard University. A lot of the work turned out to be in private collections. Nikolay Feshin was born in Kazan on November 26, 1881 (new style) in the family of a carving of the iconostasis. At the age of fourteen he entered the Kazan art school, where I studied up to 1900, 1901, on the recommendation of the school was accepted into the Academy of arts in St. Petersburg, in the workshop of Repin, from which he graduated in 1909. 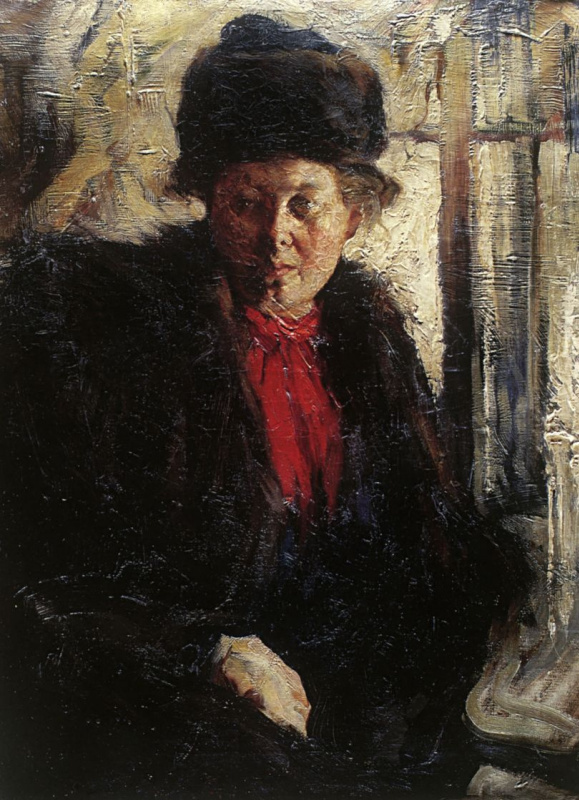 His painting "portrait of an unknown woman" (1908) in 1909, was awarded a gold medal at the international exhibition in Munich and acquired by the Museum of the Academy of Arts, and competition policy work "Butterfly" brought Nikolay Feshin the title of the artist and the right to a pensioner's trip abroad. The artist has limited foreign trip in the summer of 1910.